Standard gasoline engines achieve an energy efficiency of about 70% at their “sweet spot” (optimum speed and maximum torque load). But with all the acceleration, deceleration, starting, stopping and all the other effects of traffic, the engine can only average an overall energy efficiency of approximately 22%. Parallel Hybrid vehicles improve this by utilizing both a gasoline engine and electric motor to accelerate the vehicle. This allows the gasoline engine to be smaller and normally run closer to the sweet spot efficiency. However, it still only achieves an overall energy efficiency of about a 35 to 50%. A True Series Hybrid simultaneously has the electric traction motor driving the wheels and the gasoline engine driving a generator that recharges the batteries. This minimizes the detrimental effects of traffic on the engine and allows it to continuously run at the sweet spot achieving an overall energy efficiency of up to 70%. 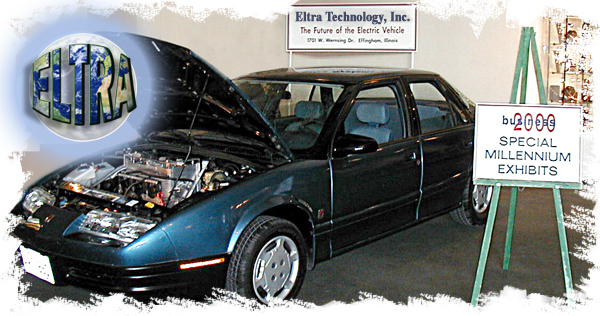 The EV1's lead acid battery pack had an energy equivalency of about one-half gallon of gasoline allowing the vehicle to travel 75 miles on this equivalent charge of one-half gallon of gas! While the EV1 had a number of other factors affecting its high mileage range, the detrimental effects of traffic did reduce the motors overall efficiency. The Eltra® patented Multi-Partitioned Motor Technology has already demonstrated the increased mileage over existing motor technology. When this technology is combined with a True Series Hybrid drive system and other techniques, the Eltra® Hybrid Vehicle is expected to reach an overall energy efficiency of up to 85% and achieve 120 to 140 MPGe.